Ran across a great website a couple days ago that provides an unbelievably comprehensive look at Rockefeller Chapel at the University of Chicago. Finding the information brought back a bike ride I took last spring when the trees were in blossom and the promise of a new summer season filled the air. The day was perfect for observing the 100 or more sculptural elements that are a part of the chapel's exterior. Now that meteorological winter is officially shut down, I thought it might be nice to see what we have to look forward to in a couple months . 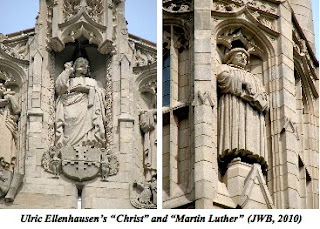 . .
All of the sculptural work at Rockefeller Chapel came from two men. Lee Lawrie created everything up to the 30-foot level, and Ulric Ellerhausen was the sculptor for the higher and less visible work although he worked in consultation with Lawrie. Lee Lawrie was, perhaps more than any other sculptor in the first half of the 20th century, the most adaptably prolific. Born in Germany, he was six when his family settled in Chicago. By the age of 15 he found himself working with the most talented sculptors in the country as they created the great sculptural works for the 1893 World's Columbian Exposition. He worked with Karl Bitter for a time as the new century began and then fell in with the architectural duo of Ralph Adams Cram (Fourth Presbyterian Church) and Bertram Goodhue (Rockefeller Chapel) until the firm dissolved in 1914. 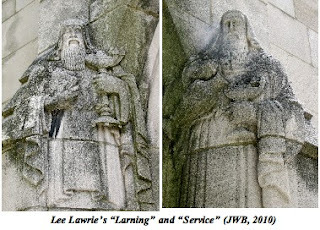 Lawrie's work spans a range of styles, from Beaux Arts classicism to Art Deco, but all of his architectural sculptures -- and there were more than 300 commissions -- have one thing in common -- they become an integral part of the buildings to which they are applied, rather than finely wrought add-ons to them. Ulric Henry Ellerhausen also was born in Germany in 1879, four years after Lee Lawrie, and came to the United States when he was 15. He studied with the three great sculptors of their era -- Loredo Taft, Gutzon Borglum and Karl Bitter -- beginning with Taft at the Art Institute of Chicago. 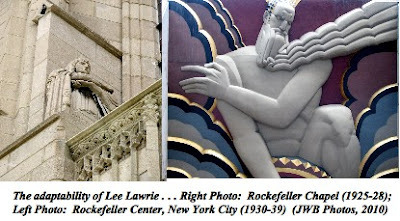 Although Lawrie and Ellerhausen worked on several commissions together, none is as lavishly decorated and as thoroughly integrated as their work between 1918 and 1924 at Bertram Goodhue's Rockefeller Chapel. Just a few of the highlights . . . I'd be blogging until July 4th if we wanted to look at each piece of sculpture. Again, thanks to the Rockefeller Chapel website for the invaluable information. Over the west entrance to the chapel, the entry where new students enter for their orientation, one finds the images of two graduates (or nearly so) of the University of Chicago, Laurens Shull and Margaret Green. On the right side of the doorway as you face it stands the image of Margaret Green, who died of pneumonia during her senior year. In her right hand she holds the light of truth while the seal of the university is to her right. Dressed in cap and gown, she holds a book with her left hand. On the day I visited a vine had twisted its way along her forehead, almost like a crown of thorns. Between the two students an inscription reads, "Ye are the sons of the living God." At the west narthex entrance are two figures, representing learning and service. I like the combination, for what good is education unless it can be used to make the world a better place? The majority of the chapel's sculpture is displayed on the south facade, on which the full magnificence of Lawrie's and Ellenhausen's work presents itself. Climbing up and down the arched pediment above the Te Deum window are a file of 15 life size statues comprising the March of Religion Across the Centuries. Abraham and Moses begin the parade on the west spire, followed by Elijah, Isaiah, Zoroaster, Plato and John the Baptist. The figure of Christ occupies the highest position, on the other side of whom we find Peter, Paul, St. Athanasius, St. Augustine and St. Francis. On the east spire are Martin Luther and John Calvin. Rising along each side of the Te Deum window are three statues. On the west side of the window are the Apostle James on the bottom, the Apostle Amos in the middle and at the top the martyred John Hus, the Czech priest who was a key predecessor to the Protestant movement of the 16th century and who was burned at the stake for heresy against the doctrines of the Catholic Church. On the east side of the window the martyred William Tyndale stands at the top. Tyndale was the first to translate substantial portions of The Bible into English. Tried for heresy, he was first strangled and then burnt at the stake. The Prophet Hosea is beneath Tyndale and beneath Hosea is the Apostle John. Beneath the Te Deum window and above the arched entryway are eight kneeling angels. The coats of arms of nine privately founded American universities alternate with the angels. From the west end they are Harvard, Yale, Princeton, Columbia, the University of Chicago, John Hopkins, Stanford, Northwestern and Cornell. John D. Rockefeller, Jr., the man for whom this magnificent structure is named, once said, "Do you know the only thing that gives me pleasure? It's to see my dividends coming in." Head over to the Midway Plaisance once the weather warms up, and draw your own dividends from a place that pays them on a daily basis to Chicago and the world.